With some help from Derek Warren, Tony Roberts has put together a walk through Finchley and Friern Barnet’s green spaces. 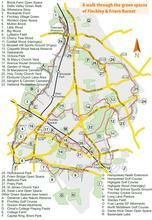 It includes five woods, five parks, three churchyards, two brook walks, two cemeteries and numerous open spaces and recreation areas. In total it is a gruelling twenty miles but it can be done in sections. You can download and print a map of the walk here, and a compact guide to the walk here. The route in detail: This circular walk can be started at any point. We start outside Totteridge & Whetstone tube station. Turn down Totteridge Lane and turn right along the footpath to follow the Dollis Brook. This leads to a large area known as Brook Farm Open Space . Below the car park turn left, cross over at the bridge and return along the other bank to Totteridge Lane. [This stretch can be very muddy so consider retracing your steps to the main road.] Cross and take the continuation along the Dollis Valley Green Walk  through Whetstone Stray [2a]. Follow the trail all the way down to Tillingham Way where a playing field blocks the way. Turn right on the road and then left into Southover, where the Brook is regained through a gate, after crossing the Folly Brook (Darlands Nature Reserve can be reached by taking the path up the right bank of this brook). However, continue to follow the Dollis Brook all the way down to Dollis Road (first passing Rocklands Pond , where the path crosses the brook just before it and back after it). Cross the road and continue on under the viaduct and take a left path to rejoin the brook, crossing back over to the Finchley side. Follow the brook until a second alley on the left opposite a footbridge takes you on a detour to the conservation area of Finchley Village Road and Green . The alley back to the brook is on the corner of the Green. Keep on the metalled path right back to the brook, ignoring a path of wood chips. Continue downstream along the brook, passing Windsor Open Space , after which a rather enclosed path brings you under Hendon Lane to the confluence with the Mutton Brook . At the childrens play area you have the opportunity to go westwards along Capital Ring. To continue the walk (along Capital Ring eastwards) take the left path and go under the North Circular Road and follow the brook to emerge eventually at Finchley Road. Cross and continue across then along the brook, keeping to the right of the brook, following the Capital Ring way markers. This time the path emerges on Addison Way and immediately back to the brook. On a second emergence, follow left until opposite a slipstream to the A1 a path to the right marked to Little Wood  takes you south via Denman Drive and on into Big Wood . At a crosspath in the wood you have the opportunity to continue to Hampstead Heath or follow our walk by taking two left turns to return to the Mutton Brook and Capital Ring. Cross and follow the Brook right, across Northway and then (still on the left bank) to Kingsley Way and then (right bank) into Lyttleton Field . Follow the main path to the right of the brook which bends right and left (through a gap in a medieval boundary hedge) to skirt the field and emerge into Norrice Lea. Go left, crossing the A1 and on the other side follow Capital Ring way markers along Vivian Way, Deansway and Edmunds Walk. At the end is a passageway through to East Finchley tube station. At the other side cross the main road and enter Cherry Tree Wood . At the far end you have the opportunity to continue to Highgate Wood or continue our walk, turning left up an alley Indigo Walk to emerge on Southern Road. Walk up Eastern Road and cross halfway up to Western Road though an alleyway and on to Fortis Green. Follow this left and then right into Twyford Avenue. A hill takes you down Church Vale where Coldfall Wood  can be seen almost opposite. Although not in Finchley it was originally part of Hornsey Common that abutted Finchley Common without any boundary. On entering the wood turn left and, keeping the western boundary in sight to emerge at the far end into Muswell Hill sports ground . (This can be muddy!) Keep left of the football pitches until recreation facilities can be seen below a grassy slope. Make for the far right where a track takes you out onto Coppetts Road. Continue down to the North Circular Road and take the footbridge, exiting left and then left again up steps to gain access to Coppetts Wood . Look out for a path off to the right into the wood. Take your time to explore the wood and scrublands and return to the original track, which now bends left and, metalled, continues on to Porters Way. A little to the left is an alleyway through to Sunny Way and Drummond Court. Turn left on Legion Way and take the path between playing fields and Glebelands Nature Reserve  (explore this if you have time). The path exits at the High Road. Turn left to gain the crossing and make your way along Bow Lane (off Squires Lane) until you find an alley (left) next to number 87 to take you into Park Crescent, the other end of which gives access to Victoria Park . On entering the park turn left then first right to cross the Park, exiting opposite Dukes Avenue. Take first right along Claverley Grove. Turn left along Ballards Lane (crossing where convenient) and continue all the way to Hendon Lane. A little way along Hendon Lane is St Mary’s, the original parish church. Go round the back into the graveyard , returning the other side of the church to continue to Park House and a conservation area, left down Gravel Hill and continue up East End Road past Avenue House. Go through the grounds , which Stephens used to develop an arboretum. Exit onto The Avenue at the rear and turn right. At the end, cross Manor View, left then right into Briarfield Avenue. This passes by Finchley Cricket Ground. At the end you have an opportunity to turn left to view Long Lane Pasture or continue the walk right past the Garden of Hope  then across East End Road into St Marylebone Cemetery . Behind the crematorium there is a rose garden worth exploring. From the front continue along Cypress Avenue to the chapel and out again to East End Road (right gate). Cross over, and take Thomas More way to St Mary’s Green. Follow Clare Close and take left alleyway through to Cecilia Close. Left down Hamilton road then along Manor Park Road leads to Holy Trinity Church, (East Finchley’s first). Go through the church yard  and right along Trinity Avenue. Make your way left along East End Road past Elmhurst/Church Lane area  and left into Stanley Road. Continue across the railway and past Stanley Road field, the subject of some controversy. Turn left along the Walks and continue all the way along King Street. This ends at the Grange Estate. Take Central Avenue right and Willow Walk to the High Road. Diagonally opposite to the right is Camden & Islington Cemetery . After examining the map at the entrance building take Viaduct Road, Cross Road, Joint Road and finally Brook Road to the far end of the cemetery and exit into Coppetts Road. Turn right and continue up past the end of Martins Walk until at a zebra crossing access left takes you into a recreation ground . Exit into Albion Avenue opposite, which takes you to Colney Hatch Lane. Almost opposite take Pembroke Road all the way down to Hampden Road. Turn right, then left into Sydney Road, at the end of which left into Alexandra Road. Take a look at Hollickwood Park if you wish . Then take the footbridge across the North Circular Road. Across this is Atlas Road and a large green space to explore . Walk up Atlas Road until the fence disappears then left up a bank brings you to a metalled path. Take this left, and eventually after a loop it leads you around the back of the retail park and into Regal Drive. At the end of this cross over Friern Barnet Road and continue along Beaconsfield Road opposite. After a while it emerges downhill into greenery on both sides. Take the path to the left into Bethune Park  (before Link Road) and continue in a straight line passing a nature reserve on the right. The path leaves the park at Manor Drive. Take second left uphill to Friern Barnet Lane. Turn left to gain the zebra crossing where you can cross straight into Friary Park . After wandering the park take the exit opposite St James’ church and cut through the church yard  left of the church into Friern Barnet Lane. Continue northward along the road about 950 yards, with glimpses of the golf course, until Sherwood Street (left) and Green Road bring you through to the High Road. Cross this at the crossing north and return left. A little way further on, on the right is the entrance into Swan Lane Open Space . At the bottom end right is an exit to Swan Lane at the bend of the lane. A spur takes you to a passageway diagonally left into Ridgeview Road at Elkanette Mews. Across the road the passageway continues and turns northward between Naylor Road and the railway. At the end of this the tube station, the start of our walk, is opposite.